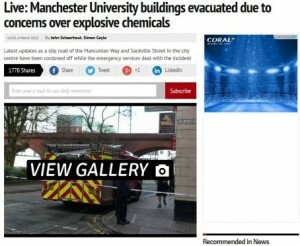 An American university made an unsuccessful bid to change the headline on the Manchester Evening News' live blog about an explosive chemicals scare yesterday. The blog had been launched following the evacuation of several buildings at the University of Manchester after a researcher's experiment went wrong. Several roads were closed and the army bomb squad was called in. But Anne Gregory, a media relations officer at Manchester University in Indiana, requested a headline change in response to calls the university had received from people fearing an evacuation on their own campus. She tweeted crime reporter John Scheerhout, who was working on the blog, but was swiftly told that no change would be possible. “I had to read the tweet two or three times," he said. "I couldn’t believe it. You would have hoped a student in the US would have the nouse to realise this was a story from across the pond. “I did a bit of research and to be fair to Manchester University in Indiana it does have a very long history going back to 1860. “It only became Manchester University in 2012, however, so I think the University of Manchester, with a history dating back to 1851 and which became Victoria University of Manchester in 1903, has a prior claim on the title," he added on Hold the Front Page.